Exercise for sciatica resulting from slip disc, piriformis syndrome, spinal stenosis, degenerative disc disease, spondylolisthesis, sacroiliac joint dysfunction etc. Although sciatica is a relatively common form of low back pain and leg pain, the true meaning of the term is often misunderstood. Sciatica is a set of symptoms rather than a diagnosis for what is irritating the root of the nerve, causing the pain. This point is important, because exercise for sciatica or treatment for sciatica will often be different, depending upon the underlying cause of the symptoms. Sciatica is a general term that refers to pain caused by compression or irritation of one or more nerves exiting the lower spine that make up the sciatic nerve. There are a number of different conditions that can cause sciatica pain. The medical term for sciatica is a radiculopathy, which means that a spinal disc has extended beyond its normal position and is irritating the radicular nerve (nerve root) in the lower back, which connects with the sciatic nerve. 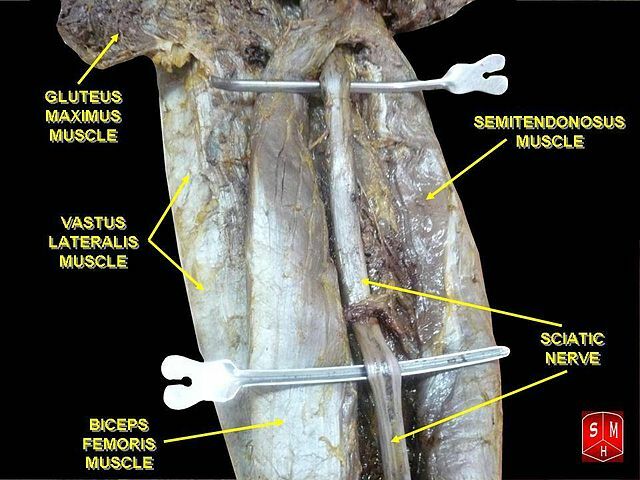 The sciatic nerve branches off as it travels down the lower extremity through the back of the leg. Sciatic pain can be experienced along this nerve route. Sciatica is generally caused by the compression of lumbar nerves L4 or L5 or sacral nerves S1, S2 or S3, or by compression of the sciatic nerve itself. When sciatica is caused by compression of a dorsal nerve root it is considered a lumbar radiculopathy (or radiculitis when accompanied with an inflammatory response) from a spinal disc bulge or spinal disc herniation (a herniated intervertebral disc in the spine), or from roughening, enlarging, and/or misaligning of the vertebrae (spondylolisthesis), or degenerated discs. The intervertebral discs consist of an annulus fibrosus which forms a ring surrounding the inner nucleus pulposus. When there is a tear in the annulus fibrosis, the nucleus pulposus (pulp) may protrude through and push against spinal nerves within the spinal cord or those exiting, causing numbness or excruciating pain. Sciatica due to compression of a nerve root is one of the most common forms of radiculopathy. Pseudosciatica or non-discogenic sciatica, which causes symptoms similar to spinal nerve root compression, is most often referred pain from damage to facet joints in the lower back and is felt as pain in the lower back and posterior upper legs. Pseudosciatic pain can also be caused by compression of peripheral sections of the nerve, usually from soft tissue tension in the piriformis or related muscles (piriformis syndrome and see below). 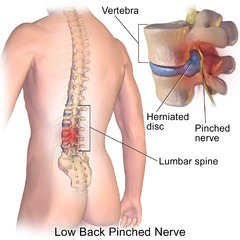 One of the possible causes of sciatica is a spinal disc herniation pressing on one of the sciatic nerve roots. The discs separate the vertebrae, thereby allowing room for the nerve roots to properly exit through the spaces between the L4, L5 and sacral vertebrae. The discs cushion the spine from compressive forces, but are weak to pressure applied during rotational movements. That is why a person who bends to one side,at a bad angle to pick something up, may more likely herniate a spinal disc than a person jumping from a ladder and landing on his or her feet. Herniation of a disc occurs when the liquid center of the disc bulges outwards, tearing the external ring of fibers, extrudes into the spinal canal, and compresses a nerve root against the lamina or pedicle of a vertebra, thus causing sciatica. This extruded liquid from the nucleus pulposus may cause inflammation and swelling of surrounding tissue which may cause further compression of the nerve root in the confined space in the spinal canal. 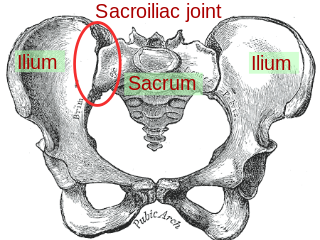 Sciatica caused by pressure from a disc herniation and swelling of surrounding tissue can spontaneously subside if the tear in the disc heals and pulposis extrusion and inflammation cease. Sciatica can be caused by tumours impinging on the spinal cord or the nerve roots. Severe back pain extending to the hips and feet, loss of bladder or bowel control, or muscle weakness, may result from spinal tumours. Trauma to the spine, such as from a car accident, may also lead to sciatica. Back extension exercise for sciatica can be started. An incremental aerobic exercise program (such as walking, stationary biking, and swimming) may begin within 2 weeks of symptoms. Jogging is usually not recommended, at least not until the pain is gone and muscles are stronger. Beginning after 4 - 8 weeks of pain, however, a rehabilitation program may benefit the patient. Exercise for sciatica plays a very beneficial role in chronic back pain. Repetition is the key to increasing flexibility, building endurance, and strengthening the specific muscles needed to support and neutralize the spine. Pelvic Tilt. The pelvic tilt alleviates tight or fatigued lower back muscles. Lie on the back with the knees bent and feet flat on the floor. Tighten the buttocks and abdomen so that they tip up slightly. Press the lower back to the floor, hold for one second, and then relax. Be sure to breathe evenly. Low Impact Aerobic Exercises. Low-impact aerobic exercises, such as swimming, bicycling, and walking can strengthen muscles in the abdomen and back without over-straining the back. Programs that use strengthening exercises while swimming may be a particularly beneficial approach for many patients with back pain. In 15% of the population, the sciatic nerve runs through the piriformis muscle rather than beneath it. When the muscle shortens or spasms due to trauma or overuse, it can compress or strangle the sciatic nerve beneath the muscle. Conditions of this type are generally referred to as entrapment neuropathies; in the particular case of sciatica and the piriformis muscle, this condition is known as piriformis syndrome. It has colloquially been referred to as "wallet sciatica"since a wallet carried in a rear hip pocket will compress the muscles of the buttocks and sciatic nerve when the bearer sits down. Piriformis syndrome may be a cause of sciatica when the nerve root is normal. Treatment begins with rest, ice, compression, elevation and referral to the appropriate medical professional. Stretching the piriformis can be used in both treatment and prevention of piriformis syndrome. One stretch involves sitting with one leg straight in front of the body and holding the ankle of the opposite leg and pulling it to your chest. An additional stretch involves laying face down with one leg bent under your stomach. Once in this position, lean toward the ground for the stretch. This second stretch is known as the piriformis stretch. STRENGTHENING EXERCISE FOR SCIATICA- strengthening of the core muscles (abs, back, etc.) to reduce strain on the piriformis. Stretching exercises will target the piriformis, but may also include the hamstrings and hip muscles, in order to adequately reduce pain and increase range of motion. Prevention- Beginning each workout with a thorough warm-up will help to increase blood flow to the muscles, preparing them for exercise. Equally important is ending each workout with a thorough cool-down in order to allow muscles to recover and rest. Increasing the strength and flexibility of the hip, buttock and lower back muscles will also help in preventing piriformis syndrome as well as other soft tissue injuries. Other compressive spinal causes include lumbar spinal stenosis, a condition in which the spinal canal (the spaces through which the spinal cord runs) narrows and compresses the spinal cord, cauda equina, and/or sciatic nerve roots. This narrowing can be caused by bone spurs, spondylolisthesis, inflammation, or herniated disc which decreases available space for the spinal cord, thus pinching and irritating nerves from the spinal cord that travel to the sciatic nerves. Exercise for sciatica here focuses on flexion exercises (forward bending). Flexing the lower spine (bending forward) increases the size of these passage ways and allows the irritation or impingement to resolve. This is why people with spinal stenosis often feel better when bending forward (such as leaning on a cane, walker or shopping cart) than when standing up straight. Back flexion Lie on the back and gently pull the knees to the chest until a comfortable stretch is felt. After 30 seconds, slowly return to starting position. Aim to complete four to six repetitions of this flex. Strengthening exercises for spinal stenosis focus on strengthening the lower abdominal muscles and include the following:Lie on the back and press the low back into the floor by tightening the lower stomach muscles, pulling the navel (or belly button) in and up, hold for 10 seconds. Aim to complete eight to ten repetitions of this press. Hook-lying march For a more advanced exercise for sciatica ,this position may be held while marching in place in the hook-lying position, slowly raising alternate legs 3 to 4 inches from the floor. Aim to ‘march’ for 30 seconds, two to three repetitions, with 30-second breaks in between repetitions. Curl-ups Another strengthening exercise that may be recommended by spine specialists to strengthen the lower abs is called a curl-up. These are done by folding arms across chest, flattening the back by tightening lower abs, then raising the head and shoulders from the floor. Hold for two to four seconds, then slowly lower to starting position. As strength builds, aim to complete two sets of ten curls. These exercise for sciatica alone will not necessarily make the patient with sciatica from spinal stenosis “better”, but they will allow the patient to more easily hold a posterior pelvic tilt during activities, especially standing and walking. This posture will allow the patient to perform more activities with less pain. The pelvic tilt is often very difficult for patients to learn and can take a good deal of practice with the guidance of a physical therapist before it is used effectively to treat sciatica resulting from spinal stenosis. Disc degeneration is a natural part of aging and over time all people will exhibit changes in their discs consistent with a greater or lesser degree of degeneration. However, not all people will develop symptoms. In fact, degenerative disc disease is quite variable in its nature and severity. With symptomatic degenerative disc disease, chronic low back pain sometimes radiates to the hips, or there is pain in the buttocks or thighs while walking; sporadic tingling or weakness through the knees may also be evident. Similar pain may be felt or may increase while sitting, bending, lifting, and twisting. Chronic neck pain can also be caused in the upper spine, with pain radiating to the shoulders, arms and hands. Neck pain may cause interrupted blood supply to the brain resulting in headaches, vertigo and worsened cognitive abilities and memory. A well-rounded rehabilitation program assists in calming pain and inflammation, improving your mobility and strength, and helping you do your daily activities with greater ease and ability. Regular exercise for sciatica is the most basic way to combat back problems. Consider it part of long-term health management and risk reduction program. Exercise for sciatica focus on improving strength and coordination of the low back and abdominal muscles. The emphasis of therapy is to help you learn to take care of your back through safe exercise for sciatica and self care when symptoms flare up. Therapy sessions may be scheduled two to three times each week for up to six weeks. Extension exercises, such as the McKenzie Method, focuses on the muscles and ligaments. These exercise for sciatica help maintain the spine’s natural lordotic curve, important to good posture. Aerobics (no/low impact) offers many benefits including improved muscular endurance, coordination, strength, strong abdominal muscles, and weight loss. Strong abdominal muscles work like a brace (or corset) to reduce the loads to the lumbar spine. It is also known that aerobics help to combat anxiety and depression. The loads on the discs during walking are only slightly greater than when lying down. Walking, bicycling, and swimming are forms of aerobic exercise a physician may suggest. Spondylolisthesis is a condition in which the affected vertebra slips on the adjacent vertebra below it. It is very commonly seen at L5 and S1 vertebra level. Patient complains of low backache, which is worst after some activity and is relieved by rest. The pain may radiate down to one or both legs. Some heat modality like SWD(Short wave diatheramy) is given for pain relief. Strong abdominal exercises are given for abdominal muscles. Active posterior tilting is tought to the patient to compensate the exaggerated lumbar lordosis. Too much movement — hypermobility or instability. The pain is typically felt in the lower back and/or hip and may radiate into groin area. Too little movement — hypomobility or fixation. The pain is typically felt on one side of the low back or buttocks, and can radiate down the leg. The pain usually remains above the knee, but at times pain can extend to the ankle or foot. The pain is similar to sciatica, or pain that radiates down the sciatic nerve and is caused by a radiculopathy. Single knee to chest stretch. Pull one knee up to the chest at a time, gently pumping the knee three to four times at the top of the range of motion. Do 10 repetitions for each leg . Pelvic stabilization exercise for sciatica should be performed to strengthen muscles that support a joint that may be too loose. This is important because the extra motion can cause wear and tear on the joint cartilage leading to degeneration and arthritis. Wall squats – Standing in neutral against the wall with your feet the length of your thighs away from the wall. Bend your knees no lower than a 90 degree angle keeping your weight in the heels evenly for both feet. Knee caps should line up with the second toe in each foot. Repeat for 8-12 repetitions. Do 2-3 sets every other day. Place hands on hip bones and make sure they stay level as you bend and lift, also keep the buttocks, shoulder blades, and mid part of the back against the wall throughout the exercise. Pelvic clocks – Lying on the floor with neutral spine and knees bent. Imagine your pelvis as a clock. 12 o’clock is at your navel, 6 is at your pubic or tailbone, 3 and 9 are the hip bones. Now imagine there is water in that clock or bowl and you are going to empty from 12 o’clock around clockwise and then counterclockwise feeling each number on the clock working. Keep the knees still so you are just mobilizing the pelvis. Albert HB, Manniche C. The efficacy of systematic active conservative treatment for patients with severe sciatica: a single-blind, randomized, clinical, controlled trial. Spine (Phila Pa 1976). 2012 Apr 1;37(7):531-42. Grice GR, Mertens MK. Gabapentin as a potential option for treatment of sciatica. Pharmacotherapy. 2008 Mar;28(3):397-402. Vroomen PC, de Krom MC, Slofstra PD, Knottnerus JA. Conservative treatment of sciatica: a systematic review. J Spinal Disord. 2000 Dec;13(6):463-9.